Of the loves of one’s life, the first is often most memorable, and when it comes to TV I had two of ‘em: Alias, in which Jennifer Garner starred as a double agent resolved to destroy the organization responsible for her fiancé’s murder, and Sports Night (1998-2000), through which I met my dream boss, managing editor Isaac Jaffe. As played by veteran performer Robert Guillaume, who died Tuesday at 89, Jaffe had backbone: He was a gruff, desert-dry Pulitzer Prize winner with a lifelong passion for sports and a soft spot for his people—most especially, perhaps, Felicity Huffman’s manic EP, Dana Whitaker. Under the aegis of series creator Aaron Sorkin, he helmed a fictional imitation of SportsCenter better than most of its real-life copycats. He had dignity, humor, intelligence, grace. In other words, Jaffe fit Guillaume like a glove—they were kindred spirits. That successive generations of viewers might remember Guillaume for different roles is no small part of said spirit: He was versatile enough to play a butler, Benson DuBois, in ABC’s absurdist parody, Soap (1977-1979); to continue the role in its more traditional spinoff, Benson (1979-1986), in which DuBois rose to the lieutenant governorship; to transition to Sorkin’s rat-a-tat deadpan without missing a beat; and to find time to play Frederick Douglas (North and South, 1985), Rafiki (The Lion King, 1994), and one half of a groundbreaking interracial relationship (The Robert Guillaume Show, 1989) in the interim. Even those unaware of his long list of stage and screen credits might well recognize his stern, comforting presence from his guest spots on a significant number of the most beloved sitcoms to air on American television in the last three decades of the 20th century: Julia, Marcus Welby, M.D., Sanford and Son, All in the Family, The Jeffersons, Good Times, The Love Boat, A Different World and The Fresh Prince of Bel-Air, to name but nine. Perhaps this, at least as much an accident of timing, is why Isaac Jaffe strikes me as Guillaume’s most essential performance, despite the fact that he won Emmys in 1979 for Soap (Supporting Actor, Comedy) and in 1985 for Benson (Actor, Comedy), becoming the first African American to do so in both cases. The actor, with his sonorous voice and precise elocution, his long résumé in the popular and the pioneering alike, understood both the power of television and its profound limitations, and he invested Jaffe with every iota of this understanding. Sports Night itself was a series about sports, and television, and politics, and personalities, and the friction caused by their coming together, and for some reason—Guillaume’s genius, Sorkin’s instinct, serendipity, magic, fate—the former’s backbone gave the latter’s high ideals shape. Isaac Jaffe was Bartlet before Bartlet, Will McAvoy with a taste for baseball; he was always the hero of Sports Night, with respect to Dana and Casey (Peter Krause) and Dan (Josh Charles) and Jeremy (Joshua Malina) and Natalie (Sabrina Lloyd), because Guillaume had the chops to find heroics in a sitcom monologue, the humor in a dramatic fight. In reflecting on Guillaume’s death, I thought of Isaac’s speech, watched it again (and again), and considered how rare it is to produce the kind of moment on television that people will recall with such specificity nearly twenty years later. I suspect Sorkin knew what he was doing when he gave the monologue containing what may be his mission statement to that Southern gentleman Robert Guillaume, that avid listener, lifelong learner, captivating speaker. I suspect he knew that this was the performer who could take these words and turn them into something some kid watching in the winter of 1998 would remember so vividly as some man writing in the fall of 2017. 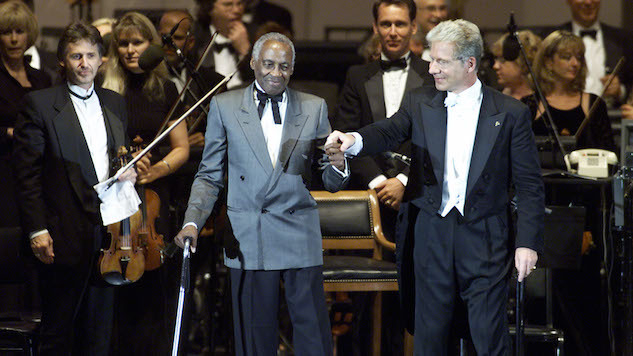 And so, though I cannot be certain He even exists, it seems fitting to bid adieu as Isaac Jaffe might: God go with you, Robert Guillaume, but trust that God’s not done with your legacy yet.